Rudy was seventeen. He lived out in the back yard, in a shed that his stepfather helped him convert into an insulated bedroom. Rudy liked it out there, separated from the glowing warmth of the main house, where his mother, stepfather, and younger brother dwelled. It was quieter and darker in the back part of the yard the shed occupied. The shed couldn't have been more than thirteen by thirteen square feet, all told. His stepfather David used to keep all his tools stored in there. Propped inside had been a couple of rakes, some snow shovels, even a wood lathe, which had cost David a pretty penny. There was also the regular assortment of toolboxes, wrenches, screw drivers, hammers, a pickaxe, barbed wire, old coffee cans full of nails, and curious odds and ends the two had liberated from various junk yards. The usual stuff a moderate alcoholic kept around for his hobbies and side-projects. Now a couple of boards resting over cinderblocks served as the front door steps. The sliding aluminum accordion panels which had hung precariously there before were now replaced by a proper door: one of those cheap hollow pinewood deals that almost begged to have a fist punched through it. The shed was situated about thirty yards from the back porch of the main house. The back of it stood about four feet from the chain link fence marking the rear perimeter of the yard. Beyond that was dense Arkansas woods standing in a carpet of dried leaves. It was early October. For some reason, Rudy dreamed more intensely during this season. He sometimes wondered if it was because the planet tilted at just the right angle this time of year, causing his dreams to fall into his head from a kind of centripetal force. Just a week ago, he had dreamed that he had awoken in his bed out in the shed only to find the walls and ceiling were missing. Kind of like what happened to the kid in the white wolf pajamas from that Wild Things book. Beyond his bed stretched the desolate forest. The main house was nowhere to be seen. There was no chain link fence. Rudy sat up to get a better look. The stars were out and the moon was three-quarters full, without a cloud in the nighttime sky. The forest surrounding made a lovely pattern of crisscrossing moonshadows along the ground. There appeared to be glowing gray-blue lichen crisscrossed along all the tree trunks themselves. The smell of pines was crisp and clear. Rudy looked up and saw that strange glowing fungus grew on the trees as high up as he could see. He was surprised how well lit the outdoors was, this late at night. Every last detail was etched in this weird twilight, and underlined by shadow as if a contrast knob had been turned to achieve better focus. Pebbles along the ground, pine needles strewn before the bases of trees, dried mulchy leaves forming a rough bedspread across the ground: all of this was perfectly visible to the naked eye. Rudy noticed every detail, the split veins spreading across leaves, and he thought he noticed an insect scurrying from a curled leaf cover to an acorn's shade, and then disappear behind the small nut's tilted crown. That was when he heard a deep bass sound. It prickled the hairs on his neck and set his heart beating quicker. It sounded like a forced exhalation accompanied by a meaty snort. Rudy whipped his head around to try and visualize the panorama of forest surrounding his lonely stage in the woods. 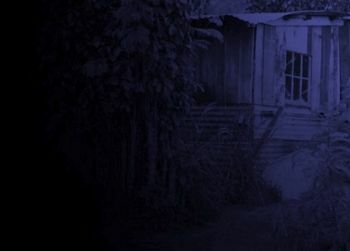 The floor and steps leading down to the earthen yard were all that remained of his shed, along with the contents of his room: a desk with a Panasonic stereo set up on it. A couple of black RCA speakers served as looming bookends. The cord stemming from behind the stereo disappeared from view behind the desk, partially erased by the night. By the foot of the bed (to the left of where the door would have been) was a bookshelf stuffed with science fiction paperbacks. Rudy briefly wondered if the stereo would work. Then he heard the snapping of a twig directly behind him, about five feet beyond where the chain link fence behind the shed would have been. That meant whatever was out there couldn't have been more than twelve feet away. Suddenly he could hear it panting. Rudy wasn't scared of dogs, any kind of dogs. He didn't care if it was an untamed wolf or a wandering coyote, they just didn't intimidate him. He perceived himself as an alpha male. For some reason though, his chest tightened up, and his heart beat faster. Maybe it was not a wolf or a dog. Maybe it was a man panting there. Rudy was too paralyzed to turn around and look. That's when he woke up, his sheets already kicked off the bed and his room back to normal, with the posters back on the walls and the cool green glow of the stereo panel indicating the time: 2:17 am. He looked over to the door. It was wide open. Some dried leaves had blown in. The smell of autumn always reminded Rudy of used coffee grounds. He got up quickly and walked over to the open doorway. He could see the back porch of the main house thirty yards away in the distance. He shuddered from the chill and reached out to shut the flimsy door. Pushing the knob in and twisting it easily to lock it didn't offer any consolation. His heart rate would not slow down. Rudy stepped back into the center of his fragile room and stared ahead in the dark. So this is what it felt like to be a rake or a snow-shovel stored away in his stepfather’s shed. Outside the wind swirled about the trees, stirring up the scattered leaves in the back yard into different patterns. words © 2017 shaun lawton. Simple theme. Powered by Blogger.